Whether you are promoting a business, school, or event, personalized items are a great marketing tool. We can add logos and designs to coffee mugs, drink coozies, pens, backpacks, stuffed animals, blankets, and more. 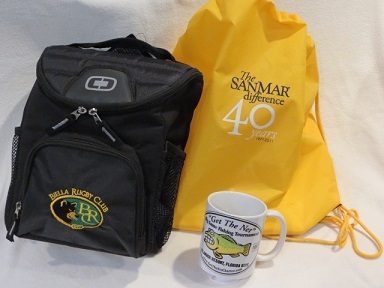 These items are great as gifts, fundraising items, and giveaways. If it can be printed, we will do it for you! We provide screen printing, embroidery, and several other methods to create your custom apparel for your businesses, sports teams, schools, or events in Port Huron and the entire Blue Water Area. Call us today to learn about our extremely competitive prices, and our FREE delivery! We can add your logo or design to many products such as coffee mugs, backpacks, pens, and so much more. Call us today to promote your business, sports team, or event.